Inspector Ian Rutledge has returned from the Great War a far different man than when he left Scotland Yard for the Army. He returned to England suffering from shell shock and only with after a great effort was he able to return to Scotland Yard. Unfortunately for him, he is given first case in hopes it will break him. Colonel Harris has been brutally murdered–part of his head all but blown off by a shotgun blast. Mixed up in the case are Harris’ young and beautiful ward Lettice, the man engaged to marry Lettice, Captain Mark Wilton, and a possible witness whose word is none too sound. There are also allusions to the important events of the time, including the flu pandemic that was so deadly. But we also have the tail end of the Victorian era, with “proper” women and wards and sensibilities that would be gone by WWII. I also liked Rutledge’s personal demons, and his battle to remain functioning and sane amidst a case to which he was sent to be broken. It was interesting to see his history unfold as well, and just how the war broke him and continued to try to destroy him long after he was home. There was one thing that bothered me, and that was how part of the solution seemed to come from out of nowhere. I quite literally had to re-read two pages at least three times before I could figure out what was going on. Yes, things made sense after I parsed it out, but it felt like it came from left field. Surprisingly, it wasn’t enough to turn me off the story at all, and after the holidays I’m going to look for more books in this series. After reading and thoroughly enjoying the Bess Crawford mystery, I remembered I had several books in Charles Todd’s Ian Rutledge series, and decided to reread them. Inspector Rutledge of Scotland Yard served in the Great War, and he’s suffering shell shock from his experiences there, but he has hoped that returning to work will help him past this, and if he’s busy, he’ll stop remembering the war, and stop hearing the voices of those lost under his command. Colonel Harris was well liked by everyone Upper Streetham, so his brutal murder came as a terrible shock. His beautiful ward was preparing to marry Captain Wilton, but rumors of an argument have made the dashing war hero a suspect, so Rutledge is sent by a jealous superior in Scotland Yard, who hopes the case might break him. This series is set after the great war (the Bess Crawford series is set during the war) and Ian Rutledge is a damaged man. What I like about this book is the same thing I enjoyed about the Bess Crawford–a look at the early twentieth century, and the changes (and destruction) wrought by the war–as well as of a world undergoing rapid change. With a wry downturn of his lips, Rutledge silently asked, How did he win his medals, you fool, if not by being so very damned good at killing? I think we still forget that. Wow. Just like the first book, A Test of Wills, the second book, Wings of Fire was also quite depressing. Which leads to me to wonder: why am I surprised that a murder mystery is depressing? After all, the very premise of a murder mystery is that someone has developed such hate, or is so lacking in compassion, they take the life of another–or the lives of several others. There’s not much there to be cheerful about when it comes right down to it. 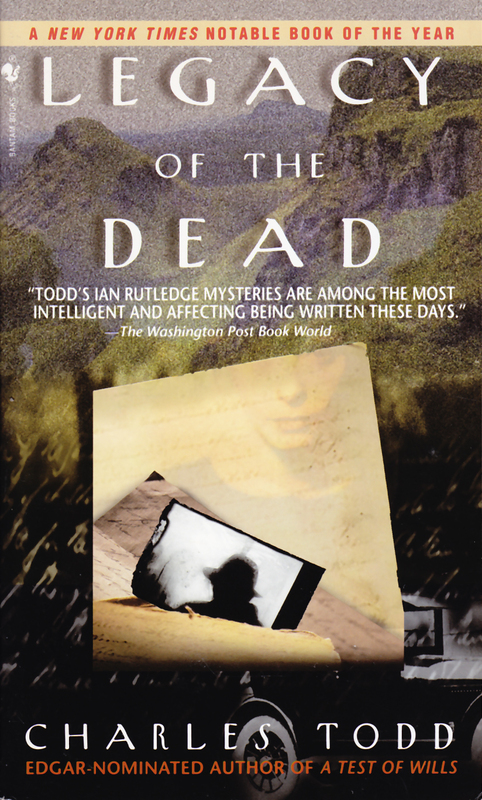 Which leads to the question: what is so different about Charles Todd’s mysteries about Ian Rutledge that make them so dark? Rutledge is a very dark character. He came out of The Great War diagnosed with shell shock. As in the first book we continue to learn about Rutledge’s war experience and how it shaped the man he is now. Of course that darkness, that slow recovery is what makes him so compelling. How fragile does he remain? How far can he bend before he breaks? Is he ever going to truly recover? How much can he take of his situation? And that is why despite the darkness I have found these mysteries so compelling. Even if I have no desire to read them one after another, I still want to know what happens to Rutledge. So what did happen to Rutledge in this book? He’s discovered that Chief Superintendent Bowles has no good will towards him, which is why he’s sent to Cornwall to appease the Home Office and a member of the upper class, who are suspicious that three recent deaths–two suicides and an accidental death–may be more than they seem. Bowles thinks this is a dead end case, and so sends Rutledge to Cornwall so he won’t make a name for himself in the current case that’s absorbing Scotland Yard. 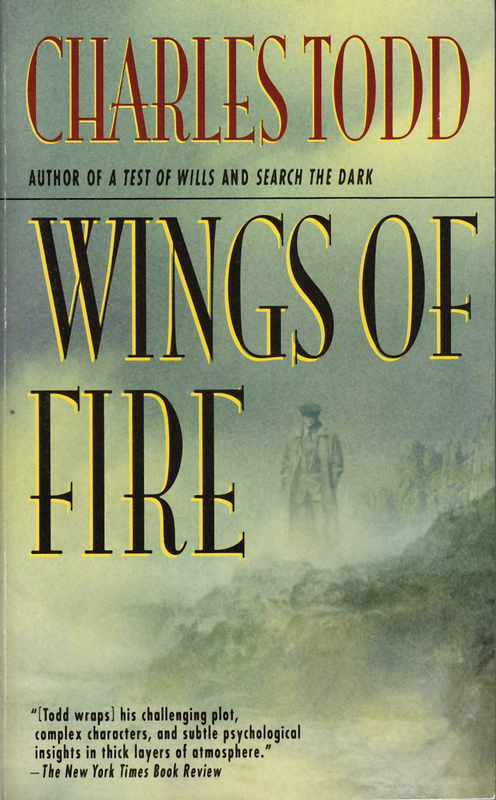 Although you should be able to read Wings of Fire without having read A Test of Wills, since the mysteries are not related, I think you’ll be missing out on the continuing unfolding of Rutledge’s past. The second Ian Rutledge mystery finds Rutledge sent to Cornwall, to look into the deaths of a prominent family: a double suicide and a fall. Adding to the confusion, one of the suicides turned out to be a famous poet, O.A. Manning, whose poems of love and war and death deeply touched many people, including Inspector Rutledge, who carried a book of her poems in the trenches during The Great War. It’s a very interesting study of the face of evil. Olivia understood that, just as well as she understood love and war and the warmth of life. As a priest I found it… disturbing. That she should know the dark side of man so much better than I. That she should believe that Gold tolerated evil because it has its place in His scheme. That there are some who are not capable of goodness in any sense. The lost, the damned, the sons of Satan, whatever you choose to call them, exist among us, and cannot be saved because they don’t have the capacity for recognizing the purpose of good. As if it had been left out of the clay from which they were formed. Interesting thoughts, shared with a man seeking a murderer. And again, flashes of the war. “I survived in those hellholes they called trenches for four years. It seemed like forty–a lifetime. I learned to trust my intuition. Men who didn’t often died. I was lucky to possess it in the first place, and the war honed it. I learned that it wasn’t a figment of my imagination. Nor was it a replacement for the God I’d lost. Whatever it was, you came to recognize it. An inkling, a warning, a sudden flash of caution, a split-second insight that saved your life. Indisputably real, however unorthodox the means of reaching you. It gave you and edge on death, and you were grateful. The history I found interesting here, was the blending of so many children–Rosamund had six children by three different husbands (all of whom died). Although typically it would be men–widowers–who lost their wives in childbirth and remarried quickly to have a mother for their children, such a blending was common. It’s interesting how blended families are becoming common again, not through death, as it would have been prior to WWII, but through divorce. It never fails to fascinate me how the more things change, the more they remain the same. Again, I don’t think this book was quite as good was the Bess Crawford books, but I still enjoyed it. 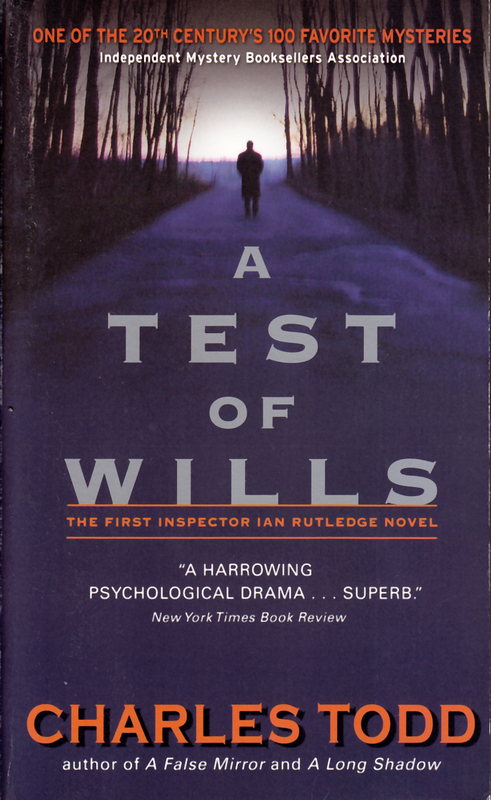 This is the third Inspector Ian Rutledge mystery. A man goes made on a train, believe he’s seen his wife and children, who were killed when their house collapsed and burned during the war. When a woman’s body appears–badly beaten and disfigured–suspicion falls upon the man. But no one knows what has become of the man–and especially–the two children on the train platform. A very convoluted mystery, and no happy endings to be found. It’s terribly sad, the way men’s minds minds broke, during the Great War, and the war that followed. Severely claustrophobic, from a living grave, severely shell-shocked bruised and disoriented, he was allowed a few hours’ rest and was then sent back to the front. This series is much darker than his Bess Crawford series. It’s hard to read too many of these books, without becoming overwhelmed. The fourth Inspector Ian Rutledge mystery finds Rutledge sent to Scotland–the last place he wants to go, for he still hears the voice of Hamish MacLeod over his shoulder, haranguing him, and reminding him of the dead lost in France during the Great War. But Lady Maude Gray has dismissed the Scottish police who have come to ask her if the bones found in Scotland could be those of her daughter, so Rutledge, with his fine manners, is sent to talk to her. 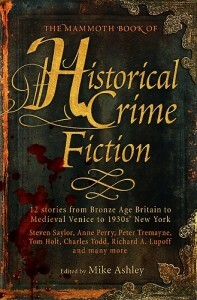 You could most definitely read this book if you had not read any of the previous stories. We see again how Hamish ended up in Rutledge’s mind, which theoretically should seem repetitive, at the fourth book, except that these are the scenes Rutledge sees again and again in his mind, and they are a reminder of just how devastating Shell Shock was to the men who were sent to the front in WWI. The case also turns out to have personal repercussions for Rutledge, but I can’t mention those without giving away major plot points and surprises. This book, like those before it, it quite dark. Rutledge is a damaged man who is seemingly just able to do his job, and always on the edge of again falling apart. The knowledge of what those young men went through, and how there lives were irrevocably changed with a war that had changed in ways no one could have imagined, is dark. But the fact that Rutledge keeps going, despite this darkness, makes you root for him, want him to win, despite the odds, despite his superior being out to get him, despite everything. Now I want to read another story about him, but I’ve got so many books backed up, I should read something I already own before buying something new. And I’m not sure it’s good for me to spend too much time in the dark place that is Rutledge’s mind. This is a single short story, and three excerpts, which I sort of found annoying, although I have to admit, that as far as excerpts go, they were interesting. The Kidnapping is a very brief story that finds Ian Rutledge drug into a kidnapping case, when a wild-eyed and disheveled man appears at the station claiming that he was beaten and his daughter kidnapped as they were leaving dinner at the home of friends. It was an interesting peek into what was probably more the daily life of Ian Rutledge than a fabulous mystery in and of itself. Not quite sure it was worth even the dollar I paid for it, since most of it was, as I said, previews for three other Ian Rutledge books. Bess Crawford is serving as a nurse in the Great War. The hospital ship on which she was serving was sunk, and although she survives, a badly broken arm sends her back to London to recuperate. A promise made to a soldier who died from his wounds while she was caring for him sends her to the man’s family, to deliver a cryptic message that makes little sense to her–and seems to lead to no action on the art of the man to whom she delivered the message. I haven’t read many books set in the era of the Great War, so I very much enjoyed the history of this tale. And I liked Bess as well–her ideas and her experiences seemed to make the actions of the women who served during that war come to life. I was also fascinated by the look at shell shock, as it was called then. The men who fought in WWI saw a great many horrible things, and lived in almost unimaginable conditions–that more men didn’t break under those conditions still amazes me. I did have one issue, however, and that was the reaction that Bess had to the man who threatened her. Perhaps she didn’t truly believe he would do her harm, but I have a hard time believing she would have so blithely gone about trying to solve a mystery and trusting him as she did. I could have believed her helping without the threats, but after the threats? It wasn’t a deal breaker for the story, but it threw me out of the story several times, as I wondered whether someone would really react as she was. Aside from that issue, I enjoyed the story and am looking forward to the next book. Bess Crawford is a nursing sister on the HMHS Britannic when its sunk by the Germans. She’s sent him to recuperate, and also to deliver a message given to her by a dying soldier. The mystery here is good, but what I enjoyed most about this story is the setting–Europe during the Great War. From across the room Ted Booker stared at him, unaware who the doctor was. I could see the blankness in his eyes. Ignoring us, he went on talking to invisible companions, men he could see clearly and appeared to know well. He was arguing, vehement and insistent and profane. It appeared that a sniper had already killed three of his men, and he was on the field telephone, asking someone to do something about it. It was a very enjoyable re-read. Bess Crawford is escorting wounded soldiers back to London, including a pilot who was badly burned, and whose thoughts of his wife seem to be what is pulling him through the horror of his injuries. Bess sees the wife, making a tearful plea to a soldier, but before Bess can reach them, the soldier has gotten on his train and the wife has disappeared into the crowd. I’m enjoying reading about Bess Crawford, and her experiences of life during the Great War. I don’t know much about that time period–but it was a time of transition, when transportation was still split between automobiles and horse drawn conveyances in the country. When women still wore corsets, yet women were also serving as nurses during the war. He also does a good job bringing to mind just how horrifying this war was for those who were living through it. The Great War was being fought with modern weaponry using ancient strategy, and the toll was terrible. There were any number of new graves, the earth still brown, and others were the grass was just a tender green. I tried not to think that for every man who died of wounds here in England, hundreds of others were buried in makeshift cemeteries in France. It was a different time, this era on the cusp of what we’d consider modernity, where men had created better and better tools to kill one another, but hadn’t yet caught up with ways to save those we went to battle. Of course, that’s not what this story was about. This book was, in fact, about murder, and Bess trying to solve that murder and see justice. But although I knew relatively quickly who the murderer was (it paralleled another story I remembered) I still read avidly, wanting to see what Bess would discover. Set in Europe in 1917. Nursing sister Bess Crawford has just escorted a group of wounded soldiers back to London, including a terribly burned pilot whose picture of his wife was what he turned to through his excruciating first days. 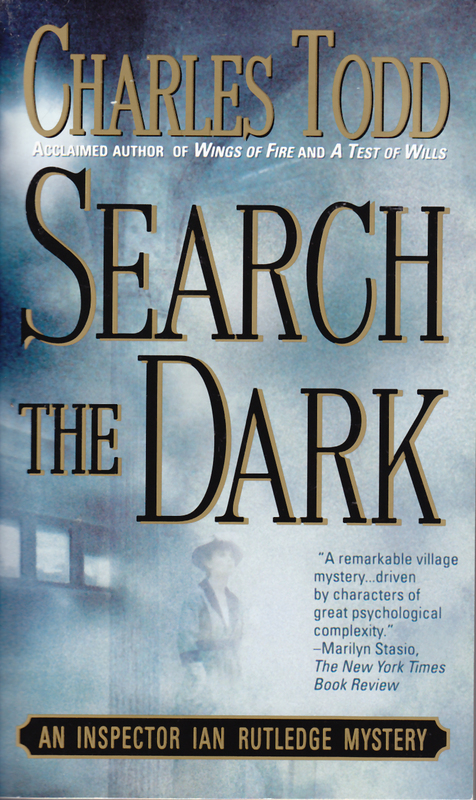 When that woman’s murdered body is discovered, Bess realizes she might have been one of the last people to see her alive. Like the previous book, the historical bits remain fascinating. (I)f Marjorie was meeting a man in places where neither of them was known, she was outside that safe circle of acquaintances and familiar surroundings that made it possible for women to move about London on their own. How strange it must have been to move from the battlefield to parties in London, as if that was the most normal thing in the world. We did indeed have a connection in common. It seems that the chaplain of my father’s old regiment— now long since retired to grow roses and tomatoes in Derbyshire— had been a friend of the rector’s father, and with those bona fides, I was accepted into the bosom of Little Sefton. As well as the reminders that so many deaths were due not to the immediate injuries but to the lack of antibiotics. The fear, as always, is infection. From the knife, from bits of cloth driven into her wounds, from the surgery itself. Antibiotics truly changed medicine in ways we often fail to recognize. A return to that time would be utterly terrifying. In the third Bess Crawford mystery, Bess has returned home for Christmas leave, but before she makes it to her parent’s home, she discovers a young woman huddled in her doorway. Taking pity on her, she ends up returning home with the woman, to make sure she is safe. A murder causes her to remain at Vixen Hill rather than returning home, much to her dismay. This was a very interesting read for me. I had a very hard time feeling much sympathy for Lydia, and a hard time understanding why Bess remained so willing to help her. On the other hand, I very much enjoyed the Australian Sargent who keeps popping up. He was amusing, and it was good to see characters who reacted to the horror of war with humor–it was a nice break from the cases of shell shock in other books. One of the things this story made clear is how close the British were to the front–a trip across the channel took one from the war to home. The fact that people serving in France could be called back for an inquest emphasized this. Here in the US, we haven’t truly had war on our soil for several generations. This reminds me how–in many ways–the US has been isolated, even when we were at war. 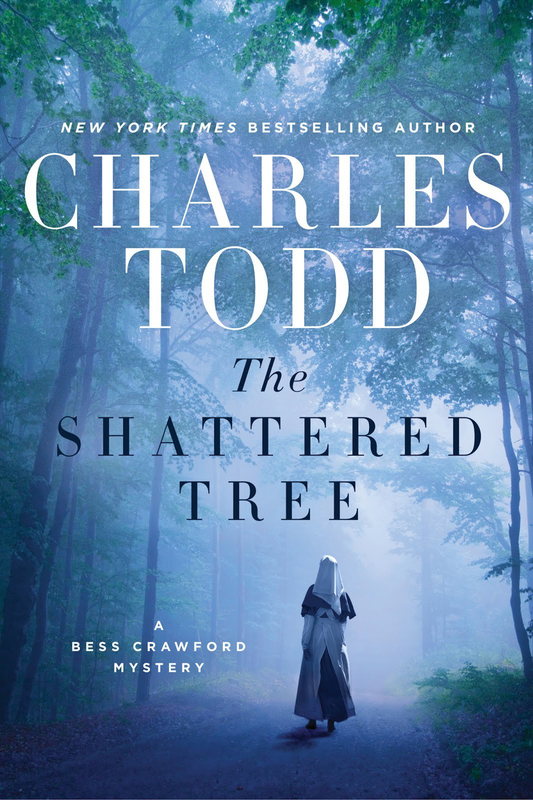 If you haven’t read a Bess Crawford book, you could certain start here, however, I don’t think this is one of the better books in the series. I take that back, it was good, but I spent so much of the book being annoyed at Lydia, it wasn’t as enjoyable. On the other hand, I have the next book waiting to be read. Bess Crawford is back in London on leave from the war when she finds a young woman hiding in her doorway. Deciding to help her leads to a chain of events including the uncovering of murder. I do love the historical settings of WWI. Florence Nightingale had changed public opinion during the Crimean War about the role nurses could play in saving lives, but it was still not considered a proper profession until the death tolls in the present war made women of every class come forward to do what they could. The US is preparing to enter the way, after years of isolationism. (M)y father has high hopes, now that the Americans are coming over. He says their General Pershing knows what he’s about.” He’d also said that we badly needed fresh viewpoints at HQ, but I thought it best not to mention that. This historical time period continues to fascinate me, and the mystery isn’t bad either. The fourth Bess Crawford mystery finds the Spanish Influenza doing more damage to the soldiers fighting–and the civilians at home–than the Great War itself was doing. I’ve been morbidly fascinated by this flu since I learned about it. It was truly a horrible disease, killing the young and healthy while more often than not leaving older people untouched. And he does a good job of making that point in this story. Spanish Influenza had already cut down three of our nursing sisters, and two doctors were not expected to live through the night. “It will have to end soon. The influenza. There will be no one else to infect. Considering how deadly that war was, it’s amazing and horrifying to realize that the flu killed more people than the war did. Which is impressive, since infection caused many deaths and amputations, since antibiotics had not yet been discovered. …(H)e managed to remove the bullet and find the tiny bit of uniform that had gone into the wound with it, probing carefully without adding to the damage already there. And of course, how very young the soldiers were. We were all so young, I thought as we drove away, the men who came to us and the sisters who treated them. I had seen and done things that my grandmother would have wondered at, but I had also discovered that courage was the ability to face what had to be faced, when it was impossible to run away. We refer to those who lived and fought WWII as the Greatest Generation, but I wonder if that appellation more rightly belongs to our great-grandparents rather than our grandparents. Set in Europe in the spring of 1918. A new enemy has entered the war, one that indiscriminately cuts down both sides. The Spanish Influenza had already cut down three of our nursing sisters, and two doctors were not expected to live through the night. The rest of us were struggling to keep men alive in the crowded wards and losing the battle hourly. Depressing to watch the bodies being carried out, one more soldier lost to an enemy we couldn’t even see. It was an insidious killer, this influenza. I’d watched men in the best of health in the afternoon gasping for breath by the next morning, tossing with fever, lying too ill to speak, then fighting to draw a next breath. I’d watched nurses and orderlies work with patients for days on end without showing a single sign of illness, only to collapse unexpectedly and join the ranks of the dying. The young were particularly vulnerable. An orderly comes to Bess, because he has found an extra dead man with the corpses they have prepared for burial detail. Bess recognizes the man, but before she can tell anyone, she is stricken with the influenza herself, and eventually ends up at home to recover. I quite like the premise of this book–that finding a body right before being struck down with the flu would not only delay reporting, but would also make her likely to believe that memory was simply a fever dream. And I appreciate the clear look at how the flu devastated the soldiers–far more than the fighting itself did. I find it fascinating how the war and modern transportation influenced the spread of the flu, and also how the flu affected the war. Another reminder that life was very different during this time. (H)e managed to remove the bullet and find the tiny bit of uniform that had gone into the wound with it, probing carefully without adding to the damage already there. For the shot had clipped a corner of (his) lung, and we were fearful that it had clipped an artery as well. But the bleeding stopped as we began to close the wound, and his color was better. Next would come the fight against deadly infection, although we had cleaned the wound as thoroughly as we could. That’s something that can’t be emphasized enough–how antibiotics truly and drastically changed medicine, and how current misuse could return us to such a nightmare. Set in Europe during the summer of 1818. I still really like this historical bits of these stories. The war is still ranging, influenza is still decimating the ranks on both sides, and the militaries are learning how to fight this “new” war. Since the institution of helmets for the men earlier in the war, and then for the officers as well, we were seeing fewer head wounds. The mind can handle only so much despair and horror. Killing didn’t come naturally to most men, although they had to become proficient at it if they hoped to survive. Many blotted out what they couldn’t face, and others buried it deep inside, where only they could see it. And some simply walked into a German bullet to stop the torment. Where the story frustrated me was that Bess kept accidentally coming across the various characters at the front. I’m sorry, I just don’t buy it. Coincidences happen, and she did travel all over the front, but that she would run into a handful of individuals out of all the men fighting and across the front was just beyond belief. Which is too bad, because otherwise I liked the story: the war, the flu, and the probability that children sent back to England when their parents were serving in India might end up in abusive situations–all those things were realistic and quite likely. And sadly, some things feel like they’ve changed so little in the intervening time. But the thought of Bess running into every person she needed to see was just ridiculous. Set in Europe in Autumn 1818. I may need to step away from this series for a little bit, or at least read something in between books, because I’m beginning to wonder just how much murder a nursing sister in the Great War can possibly witness/get involved in. That is, of course, a problem with murder mysteries where the main character is neither a police officer or a private investigator–most people aren’t regularly entangled in murders, and after the 6th murder you begin to wonder what kind of life they’ve been living to attract these kinds of people. Because it’s not like Bess is being asked by her friends and acquaintances for help (Miss Marple) or being pulled into situations against her will (Sebastian St Cyr). Things just keep happening to her. Which is frustrating, because I really do like the setting of these stories, and really enjoy the Great War bits. Several of us had taken the first-floor flat in Mrs. Hennessey’s house in the autumn of 1914 when we began our training as Sisters, for it was not thought to be proper for unattended women to stay in an hotel. It was true. Unless the woman’s father had managed to tie up the estate in his daughter’s name, everything she owned would become her husband’s property on the day of their marriage. And if her father had died suddenly, as it appeared from what the man Tulley was saying, there might have been no time to set out provisions to protect his daughter. Also unfortunately, I found this mystery rather weak and confusing. Were there really so many deserters running around England? I’m trying to decide if I’m going to finish the next book I already started or switch to something else for awhile. It’s time to take a break from this series. Reading one after the other is making me notice the weaknesses rather than the strengths. It’s unfortunately, because I thought the bits about the mill were very interesting. (A) mill had to be located near water, because water was needed in the manufacture as well as to transport the gunpowder to the scattered factories where shell and cartridge casings would be filled with it. No one wanted to see wagons of gunpowder on the rutted and wretched roads. Potassium nitrate— saltpeter— made a better gunpowder than sodium nitrate. And alder trees made the best charcoal for the formula. That was something else I’d heard. But for some time now gunpowder works all across Britain had begun to produce cordite instead of traditional black power, and that was a much more complicated recipe. With far more chances for something to go badly wrong. Bess Crawford runs into Major Mark Ashton, an officer she had previously nursed, while returning to England with a group of wounded. When he discovers her train to London has been delayed, he invites her to stay with his family, as she’d met while nursing Mark. I probably should have stopped at the previous book, and picked this one up in a month or two, because there were plenty of interesting bits I enjoyed. “I’ve had trouble with my hearing. It’s coming back now, but when the tunnel went up nearly beneath our feet, I wouldn’t have heard an artillery barrage. I was luckier than some of the lads. The shock wave killed them. I’d seen cavalry give way to trenches, aircraft learning to pursue the enemy or strafe the lines or, when the chance arose, fighting each other high above the battlefield. I’d watched tanks grow from clumsy beasts that killed more men than they preserved to useful battlefield weapons. So, I’m done with this series for now, and hopefully when I pick up the next book in a month or two it’ll have been enough time for the minor annoyances to pass.